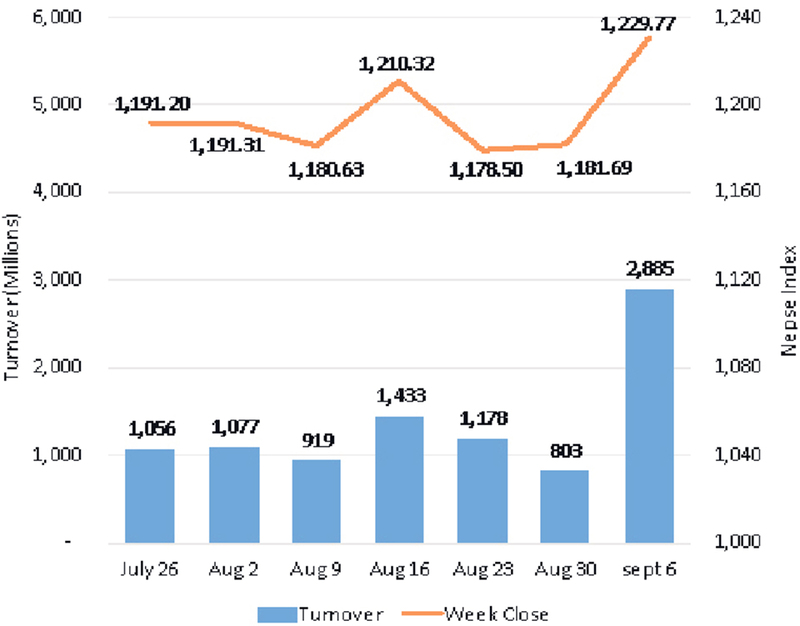 KATHMANDU, Sept 8: The sole stock market witnessed significant strength since the beginning of the week. 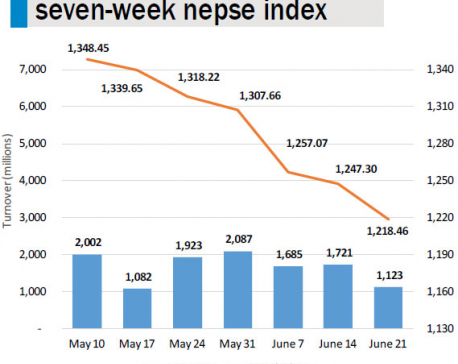 Subsequently, Nepal Stock Exchange (Nepse) index posted gains in four out of five trading sessions. On Sunday, the index added 8.59 points followed by a rise of 15.98 points on Monday. The bourse advanced modest 3.98 points on Tuesday, while Wednesday saw the biggest gain of 23.89 points in the week. Despite the Nepse index retracing a moderate 4.36 points on the final trading day, the index managed to post a substantial weekly gain of 48.08 points or 4.07 percent. The stock market, which rose a modest 3.19 points the previous week, added to its gains to close higher for the second week in a row paring all its losses from the past two months. The rally, witnessed in the review period, came on the heels of investors taking significant long positions mainly on market heavyweight banking scrips among others. Market participation also showed a drastic improvement as the bourse posted a four-month high weekly turnover of over Rs 2,885 million. Sensitive Index, gauging the performance of Class 'A' stocks, outperformed the broader market, slightly gaining 4.23 percent in the review period. Among the sectoral indices, banking stocks led the week's surge with its sub-index gaining 4.94 percent. Sub-indices of Non-Life Insurance and Manufacturing and Processing sub-groups rose 3.59 percent and 3.49 percent, respectively. Further, Development Bank and Hotels sub-indices climbed over 3 percent each. Besides, all other sub-indices ended the week in green. Among the actives, shares of NMB Bank Ltd posted the highest weekly turnover of Rs 220 million. It was closely followed by shares of NIC Asia Bank Ltd with a total transaction of over Rs 208 million. The commercial bank's scrip has surged mover 11 percent in the review period. Nepal Life Insurance Company Ltd's scrips also continued to trade actively as it posted a turnover of more than Rs 150 million. Further, Kumari Bank Ltd and Nepal Investment Bank Ltd Promoter Share registered turnovers of Rs 123 million and Rs 122 million, respectively. 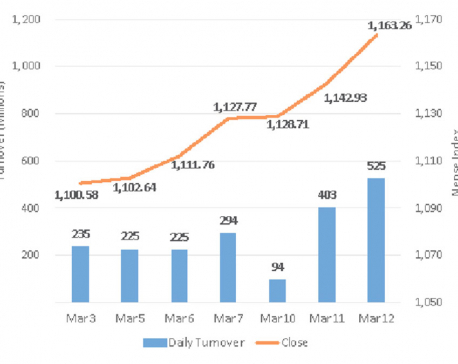 In the week, more than 6.8 million unit shares were listed in the exchange. The listing includes 4 million unit right shares of Green Development Bank Ltd and 2.32 million unit right shares of Prabhu Bank Ltd. Besides, 483,355 unit bonus shares of Asian Life Insurance Company Ltd got listed in the week. In the news, Pokhara Finance Ltd has received consent from Nepal Rastra Bank for distributing 13.684 percent dividend. The payout, which includes 8.684 percent cash and 5 percent bonus shares, is yet to be approved from the company's annual general meeting (AGM). Meanwhile, Kankai Bikas Bank Ltd has proposed 3 percent bonus shares and 6.50 percent bonus shares to its shareholders. As per the ARKS technical analysis model, the market has breached its short term resistance of 1,224 points. Consequently, the index has also climbed above its 20 and 50 day Exponential Moving Averages (EMAs). Hence, the long term sell off has fairly subdued of late and the index is likely to continue upwards, given the market activity supports the index's movement. Technical indicators also present the momentum shifting towards bulls at present. The immediate resistance lies at 1,270 points while the support rests at 1,224 mark.